Temperature measurements are most widely monitored parameter in science and industry. Temperature is defined as the average kinetic energy of individual molecules that comprise the system. As the temperature increases, the molecular activity will also increase and thus, the average kinetic energy increases. Most of the temperature measuring or monitoring systems use the principle of expansion or contraction of liquids, gases, or solids. Most often, a simple mercury thermometer is needed to measure the fluid or process temperature. This uses the principle of expansion or contraction of liquid to measure the change in temperature. There are also other techniques such as change in electrical resistance of conductors and semiconductors and thermoelectric e.m.f. used to measure the temperature. A Sensor is nothing but a measuring device which senses a parameter e.g. temprature, pressure, force, mass etc. and converts the same into a signal usually digital ( though analogue is also possible ) the signal is then sent to a convertor to convert the same into a human readable form the same is then displayed through a display unit. As far as temprature measurement is concerned there are 7 basic types of temprature sensors Thermocouple, Electrical Resistivity ( change) Sensor, Infra Red sensors, Bi Metalic strips, Change of State Sensors, thermometers and Silicon Diode ( mainly for cryogenic applications ). The type of sensor to be used would depend on the application, the maximum and minimum temprature to be measured, the medium on which measurement is to be carried out, the distance the signal should travel, the requirled precision ( least count ), the purpose i.e. Is it nearly for display or is the data being used for some other control or analysis operation. The following are the common methods used to measure the temperature which are described in detail. 5. Thermo diodes and transistors. Thermocouples are the most popular temperature sensors. They are inexpensive, interchangeable, have standard connectors and can measure a wide range of temperatures. Their main limitation is accuracy as the system errors of less than 1°C can be difficult to achieve. 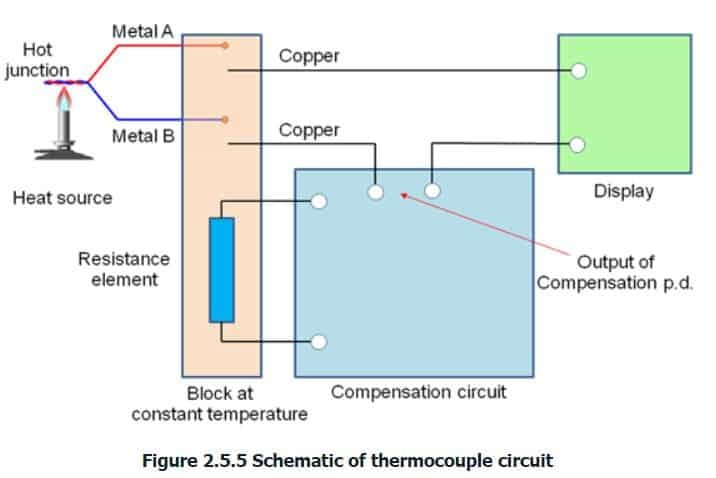 Following figure represents internal construction of thermocouple and its circuitry. The RTD incorporates pure metals or certain alloys that increase in resistance as temperature increases and, conversely, decrease in resistance as temperature decreases. RTDs act somewhat like an electrical transducer, converting changes in temperature to voltage signals by the measurement of resistance. The metals that are best suited for use as RTD sensors are pure, of uniform quality, stable within a given range of temperature, and able to give reproducible resistance-temperature readings. RTD elements are normally constructed of platinum, copper, or nickel. Bimetallic strips are used as thermal switch in controlling the temperature or heat in a manufacturing process or system. It contains two different metal strips bonded together. The metals have different coefficients of expansion. On heating the strips bend into curved strips with the metal with higher coefficient of expansion on the outside of the curve. Thermistors follow the principle of decrease in resistance with increasing temperature. The material used in thermistor is generally a semiconductor material such as a sintered metal oxide (mixtures of metal oxides, chromium, cobalt, iron, manganese and nickel) ordoped polycrystalline ceramic containing barium titanate (BaTiO3) and other compounds. As the temperature of semiconductor material increases the number of electrons able to move about increases which results in more current in the material and reduced resistance.Thermistors are rugged and small in dimensions. They exhibit nonlinear response characteristics.